Anouk & Vianne . . . and The First Winner of Bag Naming Contest Introducted! If you participated in the Ella Coat Knit-a-Long you know her as Moo2Moo, the fascinating lady of notable wit who made an amazing Ella Coat AND wrote the charming, funny notes that kept us all reading to the very end. Without further ado, I introduce to you Anouk & Vianne! Mythical chocolatier Vianne Rocher and her daughter Anouk were weavers of magic, capable of transforming simple, every-day ingredients into mouth-watering works of art. Ginger, salt, cinnamon, gold . . . elements previously disparate surprise and delight the senses. These bags, like the chocolate confections of Vianne, are more than the sum of their parts, more than simple chocolate, simple bags: Anouk is small and playful, teaming with vibrant energy; Vianne is more refined and formal. You admire her across the room though she has said nothing. She is captivating. Both move with ease through cities, through gardens mysterious with fog, through windswept landscapes. After reading Moo2Moo’s/Amanda’s notes, her lovely description . . . I started to wonder, just who is Moo2Moo/Amanda? I scoured her Ella Coat page for clues and couldn’t even figure out what she looks like. I asked her for pictures. . . and she sent me a portrait of herself. My great grandmother taught me to knit cotton dishcloths when I was somewhere between 6 and 8 years old. It was boring as hell and something I quickly abandoned, preferring to spend my time with my nose buried in a book, any book, something I’ve never grown out of. Last summer [my emphasis!] a friend came to stay bringing with her a scarf she was knitting. She wanted to knit a tea cosy as a gift for her sister and so we surfed and found Ravelry and a veritable deluge of tea cosy patterns. I fell in love with Debbie Birkin’s Owl Tea Cosy despite not having knitted anything in about 3 decades, nor owning a tea pot or even being a tea drinker. We took a trip to Hobbycraft (a craft department store) and came home armed with the necessary materials (and quite a lot of totally unnecessary things). After that I watched quite a lot of YouTube videos in order to learn how to cast on and to remind myself how to knit. With each new technique I’ve needed I’ve found a YouTube video to suit. I’m originally from Yorkshire (bleak rolling moors, huge mills and lots and lots of sheep – parts of it are just as they appear in Wuthering Heights) then I moved to Bristol (the worlds greyest city) for University where I emerged with a BSC. Hons Microbiology and a rather unexpected biological development of my own. Six weeks after siting my final exam the OH and I got married and two months after that (daugher no. 1) arrived in the world. After that we moved to London which served only to confirm that I hate big cities, I’m not overly keen on small ones either. Shortly after that we moved to a cottage in North Wales where our closest neighbours are sheep, sheep and more sheep. The garden is full of chickens and we’re surrounded by green fields. Best of all you can see the stars each and every night. Birds sing all around us and at night you hear the hoots of owls and the swift whoosh of air as you’re buzzed by the local bats. The house is heated with coal stoves and warm and cosy all year round. This is my forever home. 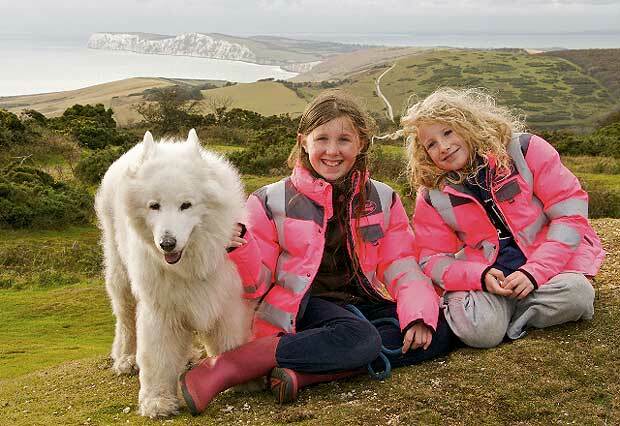 Take a look at the landscape behind Amanda’s lovely daughters and cute dog! I’m ready to move myself! What do you do when you are not knitting? When I’m not knitting (which is the vast majority of the time) I take the dog for long rambles through the countryside, occasionally I remember to weed the garden, spend time with the children and make tons and tons of jam from pretty much anything I can get my hands on, I even joined my local Country Market Co-operative to get rid of the surplus. In between times I work full time at a local primary school which is the single most fantabulous job in the world….. although its a bilingual school and I’m not [bilingual], so I spend a fair amount of time improving my Welsh so I can reply when children ask “Gallau mynd i’r ty bach os gwelwch yn dda?” (can I go to the toilet please). My first school outing was to a Jamborii where the staff had to go up on stage to sing the Welsh National Anthem……. 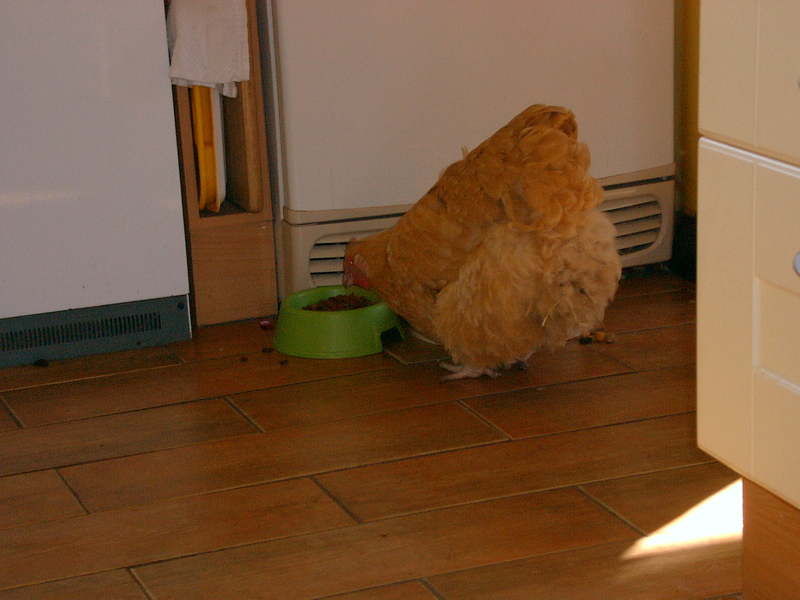 which meant much crash revision on the coach trip….. even with the words on paper I was scuppered, especially when one of my co-workers told me the first couple of lines were My Hen Laid a Haddock, one hand oiled a flea. Even now that’s the first thing that pops into my head. My favourite food has to be Mexican, although chocolate comes a close second… and bacon crisps (which my husband finds hilarious because I’m most definitely vegetarian). Honeysuckle. They seem to survive no matter what the weather is like here. The wind rips the heads of pretty much everything else. I like crocuses too just because they’re so cheery and hint at spring weather. Any windswept green open space with nothing but granite outcrops for miles on end – it reminds me of my childhood. Failing that, the Zambian side of the Victoria Falls–its a truly magnificent place and like stepping back in time a century or so. Cesare Milan? He reminds me of George Michael back in the Wham days. If I could have coffee with anyone it would be Marie Curie – how on earth did she come up with the idea that zapping people with radiation would be beneficial to them? I’d also love to have met Jim Henson (creator of the Muppets) but I doubt I’d have drunk anything for laughing. When I asked her for some pictures, she sent me these. . . They were taken on a photoshoot for WightLink Ferries which came about totally by accident after I filled in a questionaire pretending to be a dog whilst very bored on a ferry crossing. If you download the following brochure we’re on Page 3. The castle itself is a magnificent motte-and-bailey dating back roughly 1000 years. It has breathtaking views and a working donkey powered water wheel. Its a fabulous place for long walks and great for your thigh muscles as there are several hundred steps to go up and down as you wander along the ramparts and through the gardens. The day we visited co-incided with an English Heritage re-enactment weekend so we got to see cloth being woven, hand spinning and a very early spinning wheel in action. [My] daughters were more taken with the working black smith forge, which was set up in the middle of a field, and the gentleman in full battle dress wearing boots handmade by the chap who makes boots for the Yeomans guarding the Tower of London. The level of craftsmanship demonstrated and the sheer passion for history made this a superb day out and rekindled a childhood desire for a spinning wheel….. which I’m in the process of sourcing, not that I’ve let on to [my husband] yet. I’m waiting for his workshop and lathe to arrive before I drop that particular bombshell. I thank Amanda for answering my questions, sending such great pictures, and writing such lovely project notes and bag descriptions! I know we are all looking forward to her next set of Knit-A-Long project notes! I am late in posting this week’s installment, I know. I was teaching all weekend and got completely confused about the days. Took a day off and took my little guy to the park . . . It was wonderful. But let’s to the task at hand! You are busily making fuchsia stems or you have made them all. Now follow the pattern as written to complete the fuchsias. I won’t interfere with any of that. Some advice for finishing fuchsias. 1. Trust me when I say to tack the inner petals to one another. . . they look more beautiful and real if they are tacked together as suggested. 2. Wire the outer petals with 28 gauge wire. Even 30 gauge wire would do nicely. But I think that 26 gauge is too heavy for Silk Cloud. If you are working with heavier weight yarn, then you can work with a 26 gauge wire. Here is a picture of a single fuchsia that has been half wired. I think you can see which petals looks better! Don’t worry about the wire making the wearing of the wrap into a pointy affair. It is so light weight that it will bend easily. You may find yourself re-shaping the petals now and agian. 3. For the best look of pistil and stamens, tie tiny knots in the strand of yarn that represent these parts of the flower. For this purpose, make pistil and stamens about twice as long as called for so you will have room to tie knots. Once knots are tied, then dot with fabric glue, let dry and then cut. Follow the stamen instructions in the book for best results. For next week, please finish your fuchsias. I will discuss the business of sewing them to your wrap in my next post. No. 3 Begin Your Fuchsias! We now begin the flowers! You may still be working on finishing your wrap or you may already have completed it. Nevertheless, let’s start working on flowers. Here is what you need to do even before you start knitting the flowers themselves. 1. Figure out how many fuchsias you want to have dripping from your wrap. I have 3 peduncles for every end of the wrap: 6 peduncles total. One of those peduncles has two pedicels–two flowers on one stem. 2. Decide if you want your flowers to be made using a single strand or a double strand. Above you can see the difference between a stem made using a single strand of lace-weight silk mohair (left) and a double strand. Both were worked on the size 1 needle. Both look lovely, but the single-strand fuchsias are more delicate. You could even mix and match. Knitter’s choice. 3. Now, Make All your Little Stems. Once you have decided how many you want to make and whether to use a single or double strand, set to work making all your stems. I have my waiting stems on markers. My recommendation is to make all of your stems slightly different lengths. This is easy to see if you work them all just to the point before you will start increasing for the shaping of the flower. It was asked on Ravelry in the forum for this wrap how long I made my own stems for the wrap. I would say to vary the lengths between 3 and 6 inches. But the real test is your own eye: work those little stems and then curl and twine them on the end of the wrap the way you think you will want them when the wrap is finished. . . If you find that one seems too short, add some rounds. . . If you find that you don’t really like the look of the green stem against the wrap, there is no reason you shouldn’t start your flower with the wrap color and just keep on going, making the stem short or long to your heart’s dictation. This way, the stem will create a tone on tone design. You can use your green yarn to make a sweet little necklet with fuchsias or other flowers decorating it. Next Monday: we will move on to the next part of the flower. Happy stem knitting – the foundation of most flowers! I have been thinking a lot about the length of the wrap, how to create more than one wrap out of the yardage you have (to keep or give as gifts). In other words, my goal here is to help you maximize your materials. I was reading some of the Ravelry group commentary about the wrap and it sounds like folks are grappling with some of the same issues that I did/am. Sharper needles work better (I resorted to my grandmother’s old straight aluminum needles as they are the sharpest I own). And many of the other issues are the nature of the beast. . . I did not cast on with larger needles myself as I liked the cast on and bind off edges pulling in a bit. The flowers weigh down the ends and create lovely arches between the flowers. I did not block my wrap as I liked the ruched qualities of the un-blocked fabric. The larger stitches are just as troublesome as the small ones but for different reasons: large stitches don’t want to slip, no matter the needle or the looseness of the stitches, in my experience, so I found myself moving them rather laboriously down the needle. Don’t dare put the stitches on waste yarn to hold them as you’ll need a magnifier to get them back on the needle–at least I did! It was a trial I would like not to repeat! I like long wraps. I live in Maryland and our winters are not usually blisteringly cold, but when my neck is cold I feel cold. I often have a scarf on for 8 months out of the year. I like wrapping a scarf multiple times . . . so, for my latest one, I have opted for a long Gossamer Wrap. If I have any left over main color, I will make a little cowl. . . same basic recipe, but only work for about 30 inches (76.5cm) before sewing the beginning and end together using a standard mattress stitch. I will end with small gauge stitches and then sew. . . or it would be possible to start with a provisional cast on [here I would use a larger needle. About a 3 (3.25mm)] and then knit the two ends together. This is a great way to use up your leftover yardage. I am working on an inner petal color cowl right now. If I want to convert this into an infinity scarf/wrap, I will work until about 60 inches (152.5cm), then, to graft, I will flip the fabric once, twice (as with the Poppy Cowl) before grafting. This way, the wrap will not be twisted when you double it. The lovely thing about purchasing full skeins is that you can make several wraps with different qualities from the same materials. 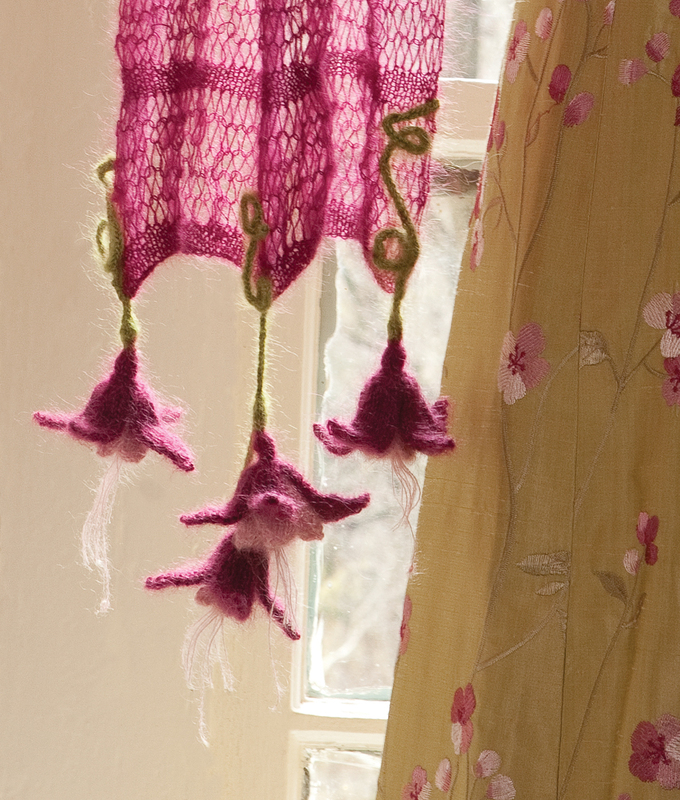 Picture a green wrap, even, with the fuchsia seeming to grow out of the knit stitches. Your homework for this week is to continue working on the wrap. Pick a short wrap, a cowl, infinity wrap, or long scarf/wrap and try to reach completion. Please make sure, if you bind off, that you follow my instructions for the sewn bind off. If done according to the instructions, your cast on and bind off should be equally stretchy and have more or less the same appearance. If you use a conventional bind off, you will have virtually no stretch and you will probably be very regretful. If you try to back it out, you will suffer . . . so trust the pattern. Those who are participating in our Ravelry group, please keep us updated about how long you will be making your wrap and post pictures. Next week, we will begin to make fuchsias. I will address issues of attachment in later postings, so please wait, not only for these techniques but ideas on how to attach the flowers and orient them in a way that pleases the eye on different length wraps. Let’s start with the wrap. We will begin some flowers during week 3, so please set aside some of the wrap color yarn in order to make flowers – shoot for 10 yds (9m) per flower. To make the pictured wrap, that works out to about 80 yds (73m). If you are working in a larger gauge yarn, or doubling a lace weight yarn, you will need to set aside more yarn. 2 skeins Shibui Silk Cloud. This yarn is lace weight silk mohair. There are a number of alternatives out there with similar content, but I tried most of them when I was making this wrap and I found that the Silk Cloud was the softest, most delicious of the options. As you may be finding out, if you are on the hunt for the colors called for in the book, Blossom, the light color I used for the Fuchsia interior petals, has been discontinued . . . There are other brands of lace-weight silk mohair that have a similar color, so feel free to substitute. . . I have a single skein in my studio, so I have enough to make several kits. Contact me if you are still on the hunt for this color. There is still time for me to get it to you before we begin the flowers. There are some lovely new colors in the Silk Cloud; I am currently making a wrap in Mulberry, a lovely deep plum color, with “Blush” inner petals. The green is still “Wasabi” though it has recently been re-named “Apple.” Here is a picture of this color combination – it is truly delicious. 1 skein each of Shibui Silk Cloud in the wrap color, a lighter color for the inner petals of the Fuchsia, and a green for the stem color. While 2 skeins of the yarn will make a wrap that will float beautifully around your shoulders, I have created kits for the wrap that include 3 skeins – enough for flowers and enough to make a longer wrap because I think many people, myself included, may want a wrap that drapes over your arms (rather than sliding off your shoulders) if you let it fall from your shoulders. I also like the idea of wearing it with a suit more as a conventional scarf with the flowers falling down the back. Sometimes Silk Cloud is hard to get and it would be a pity to go searching for the skein you want only to find that you can’t find it . . . I have some ideas for how to use most if not all of the skeins for the lighter color and the green. . . so you might be wishing you had gotten full skeins instead of mini-skeins. I know some have been concerned about left-over yarn. I have these same concerns, so part of the objective of this KAL is to inspire you with ideas that help you use all the yardage you have. Playing with Gauge: bigger flowers, more substantial wrap . . .
Perhaps the thought of casting on to size 1 needles really has no appeal for you, or you don’t want such a light and airy wrap. By all means, please experiment with other yarns and gauges. If you want to keep the same look but want a bit more substance to the wrap and greater ease of working, consider doubling the yarn and working on a size 3 or 4 for the narrow, small gauge bits and going up to a 15 or 17 needle for the airier, larger gauge sections. You may need an extra skein of the Silk Cloud, in this case, bringing your total to 4 skeins. Or consider working in Cashmere, or a delicious silk blend – you will want something rather light and with some loft in order for the wrap and flowers themselves to have a lightness and delicacy. Swatch to see what will work best if you have several options at hand. Your homework for this week is to settle on your yarn, cast on, and get to work on the wrap. I used a conventional long-tail cast on for the wrap pictured. . . I’d like to see you work at least 8 – 18 inches of the wrap by next Monday. The wrap knitting is quite simple and I would rather you swatch a bit and even start your wrap a bit late in order to put all that work into something you will love. When I was working on the wrap, I did the knitting in fits and starts. I found that when I worked on the smaller gauge bits I had to pay attention to every single stitch. I couldn’t watch a soccer game my son was in or even pay attention to the nature program on TV. I could talk on the phone or visit a friend who understands about visiting and knitting. . . Larger gauge bits I would work without looking and they were done quickly. I will discuss the length of the wrap next week, offering ideas for how to finish wraps/scarves of different lengths. I have the idea that this Gossamer Wrap, as with the Ella Coat, can have many different looks, can be many projects, and inspire yet more. I invite you to explore some of the variety this basic pattern can yield. Enjoy the process of discovering that variety! And take time this week to knit in the garden. Here is where I am going right now. . .
Like the Book, Write a Review . . . and you could win . . .
For all you Noni & Noni Flowers book fans, I’ve got a special opportunity for you! I have been working on annotating 2 copies of my book, adding notes about the different plants, the photographs, things that didn’t make it into the book, or that didn’t fit in the book, some secrets. . . confessions of a passionate gardener-knitter you might say. Here’s an example: The fabulous curved tulip leaf in the photograph that graces the cover of the book was from my own garden. We were photographing many of the flowers in Springtime almost exactly a year ago. On photoshoot mornings, I scoured the garden for foliage I could use in the photographs–sometimes I was digging under snow!. The foliage for the Clematis was carefully wrested from an icy patch on the morning of one shoot. 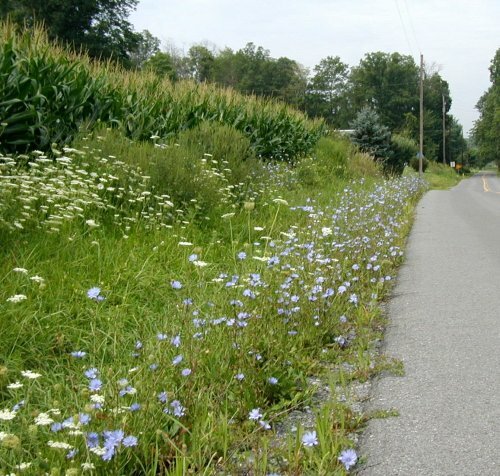 The Chicory stems I collected on the side of the road–I had passed the flowers looking for good stems, each one better than the last . . . I had to turn around and go back, pulling off onto the shoulder. That morning was hot, I remember, even so early. The stems are very tough and I couldn’t break them with my hands. I had to use my car keys. . . I am going to give these two special books away. . . here is how you make yourself eligible to win one of them! Write a detailed, review that helps knitters and/or gardeners understand why you like the book, and why the reader will want to purchase the book. Post it on the the Amazon and/or Barnes and Noble websites. 1 book will be given to an Amazon review. 1 book will be given to a Barnes & Noble review. If, by some crazy fluke, the same name is drawn for both books, I will draw again until we have two different winners. It’s raining here today. . . slow, heavy drops that sink into the soil and make my iris last and last. The late-blooming fancy tulips I paid big bucks for are still fabulous in this cool weather. . . but I am hoping that the rain rains itself out by Thursday. . .
Because I have been madly preparing for the Maryland Sheep & Wool Festival as I have a booth at the Festival this year! For those of you who are local enough to come to the festivities and fun, my booth is a tent “on the hill” in location N-20. What this means (at least as I could tell Sunday as we walked across the Howard County Fairgrounds to see where everything was) is that if you come in the main gate and walk straight up the hill toward the highway, you will probably be able to see the back of my booth as you walk up the hill toward me – I am hanging a big banner of the cover of my book on the back of the tent. Take a look here at the map of the fairgrounds. I am one of the “outside North vendors”. My advice? Arrive early, stay late, come both days, plan to have a great time. Here are the treats I will have at my booth: the New Noni!–2 of the new bags will debut at the festival. If you can’t come to the festival and you can’t wait for your LYS to order them in, I have complete custom kits, hardware kits, and the patterns will be up on Rav very soon! The NEW Ella’s Going out Bag causes a sensation where ever she goes . . . The French Anemones will be in their own pattern at the Festival . . . There will be one other new bag . . . come to see! I have beautiful Noni kits for The Creeping Phlox Clutch, and The Gossamer Fuchsia Wrap PLUS the samples that were photographed for the book will be live and in fiber at the show. And, of course, THE BOOK will be there with me in quantity. If you have been holding out to get your copy, now is your chance to get an in person signed copy. I will be signing books at the official Book Signing on Sunday from 11:45 – 12:15 in a tent next to the Information Tent, but I will also be signing books at my booth anytime. Monday was the photoshoot for the new 2 new bags and 1 flower I will debut at the show. 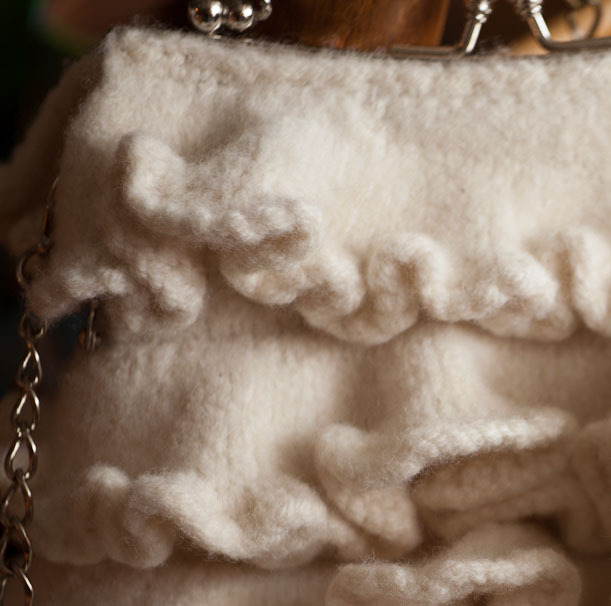 I am also re-releasing my Winter 2011 bags, Cornucopia and New York. They will come out at the Festival with new covers and will be there in the felt for you to see. Photoshoot Photo Journal: Tune back in later in the week for a photo journal of the photo shoot and some sneak peaks of the new bags! For those who are eagerly awaiting the announcement of the new bag names and, consequently, the contest winners, I am carefully going through the entries one more time and will post the winners shortly. Gossamer Wrap KAL Update: We will begin on May 7th! Look for a Gossamer Wrap preparations blog tomorrow as well as a KAL preparations e-mail in your in-box sometime later this week. If you have not yet gotten your supplies, I have beautiful kits in the studio with your names on them. AND I will have the kits at Sheep & Wool as well.